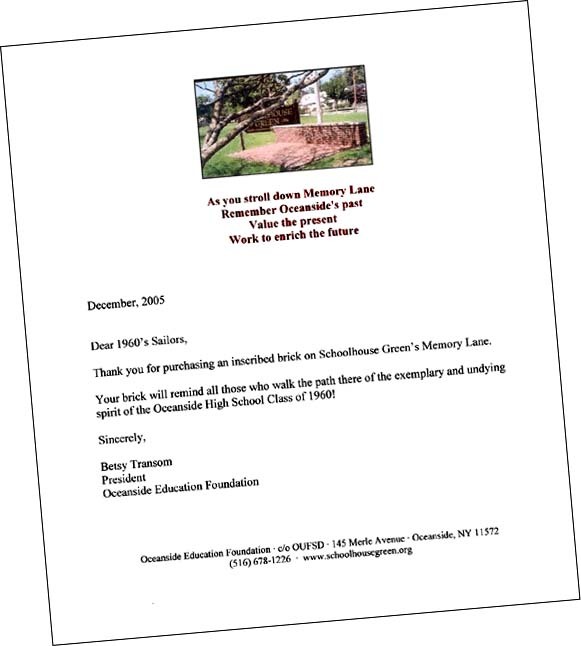 The Oceanside Education Foundation, Oceanside's historical society, has created "Memory Lane" on its Schoolhouse Green property where, in perpetuity, donors can place inscribed bricks honoring or commemorating Oceanside residents, other loved ones or Oceanside institutions. 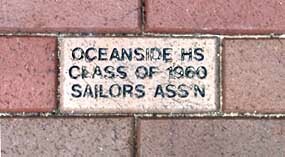 * That is, after presenting in June 2003, in conjunction with the Oceanside Chamber of Commerce, a tribute plaque to hang in Nathan's Famous. BACK to "Our Little Town"
Copyright © 2000-2013 by Howard B. Levy and the 1960 Sailors Association Inc. All rights reserved.